This tour allows you to discover in a few days Bulgaria with the mysteries of its ancient history and nature. Apart from visiting the capital Sofia and the second largest city - Plovdiv (which as well is one of the oldest citıes all over the world with history of over 8000 years living city) tour takes you to the Rhodopes mountains where the mythical Orpheus used to sing songs to Eurydice. 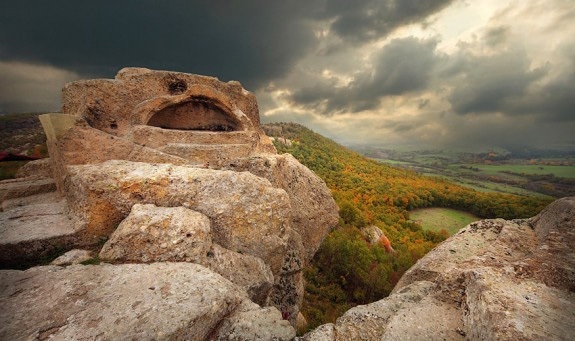 You will visit shrines and Thracian tombs of 3,000 years - Tatul and Perperikon. Later on you will have a chance to kayaking in Arda river, to observe Egyptean vultures or horse riding. Arrival at Sofia Airport. Transfer to the hotel. Guided walking tour of the city - about 2,5 hours. When visiting you will cross a few thousand years - from 8-th century BC when the Thracian tribe Sredets founded the city and gave its first name: Serdika or Serdopolis, through the time of the Romans, who transformed it into a thriving Roman city. Serdika was the favorite city of Emperor Constantine the Great (306-337), who said: "Serdika is my Rome". The city was renamed .Visiting the city you will see one of the oldest churches in Sofia, the basilica "St. Sofia", with its Necropolis (2nd century BC AD - 5 th century AD AP); the magnificent cathedral "Alexander Nevsky" with its gold domes, the old ruins discovered in the underground passage connecting the Presidency to the Council of Ministers; the oldest churches in the Rotunda Sofia "St. George", built in the 4-th century etc. Dinner. Overnight in 4 * hotel. The archaeological complex Perperikon is one of the most ancient monumental megalithic structures, entirely carved into the rocks. It is one of the most popular tourist destinations in Bulgaria. Religious activity at the top of the cliff began in the 5th century BC. The latest archaeological research show clearly that the temple of Dionysius was located exactly in Perperikon. According to the legends, two crucial prophecies were made from the altar of this temple. The first one predicted great conquest and glory for Alexander the Macedonian, and the second, made a several centuries later, predetermined the power and strength for the first Roman Emperor – Gaius Julius Caesar Augustus. Departure to Tatul Thracian sanctuary (50 km, 60 min). The Thracian sanctuary near Tatul Village is one of the most imposing megalithic monuments discovered on the territory of Bulgaria. The complex comprises two sarcophagi, a rectangular bed for the main altar, and a three-metre-deep well. It dates back to the end of the 5th and the beginning of the 4th centuries BC. Evidence to that is provided by the clay vessels that were discovered in the region. 4th day – Kirdzhali – Madzharovo (65 km, 1 h 15 min). Breakfast. Departure to the village of Madzharovo. The regıon ıs famous wıth ıts wild beauty and is one of the most popular destinations for ecotourism in the country. The locality covers a part of the narrow valley of the Arda river, surrounded by mountain slopes and rock massifs. You will have a chance for horse riding or bird watching in the region, where 174 bird species have been established (40 of them have been included in the Red Book of Bulgaria (a list of endangered and disappearing plant and animal species in the country and some are globally endangered species). In 1997 the territory was declared an Ornitologically Important Place by BirdLife International. Dinner. Overnight in a family hotel. 5 th day – Madzharovo. Breakfast. Now it’s time to explore wild nature and different local activities. First, we go kayaking in Arda river – an exciting experience. After that you we have a tasty lunch on the open air. Then you can watch Demonstration of gold-mining, in the old-times method; to make a half day tour for minerals and semi-precious stones, to looking for wild bees or watch demonstration of Catching wild cow with a lasso. Picnic in an open air. Breakfast. Departure to Plovdiv, 2-d largest city in Bulgaria. Plovdiv is one of the oldest cities in Europe. It was founded before Athens, Rome and Konstantinople and as old as Troya. The firt inhabitants – Thracians, were famous in the ancient world for their high quality wines. The period of the Romans left us numerous public buildings such as the amphitheater of Plovdiv (end of 1-st and early 2-d century AD, it is still used for open air performances), the Roman Forum (2-d century AD) the Roman stadium with a length of 180 m with 30 000 seats (2-AP century AD). During this time the name of the city was Trimontium "town on three hills". The old town of Plovdiv (18-19 century) is full of lovely houses in typical Balkan style. Dinner. Overnight in 4 * hotel. Breakfast. Departure to Sofia Airport. The detailed program is available on request.